This afternoon I’m coming home after a morning running a short process for a church in Victoria, BC. The brief was pretty straightforward: help us decide between four possible scenarios about our future. Lucky for me, it gave me an instant application for some of the stuff I was learning in London last week. The scenarios themselves were designed through a series of meetings with people over a number of months and were intended to capture the church’s profile for its future, as a way of advertising themselves for new staff. What was smart about this exercise was the fact that the scenarios were left in very draft form so there was no way they could be confused for a “vision” of the future. It is quite common in the church world for people to engage in “visioning exercises” to deal with the complex problems that they face, but such visions are doomed evermore to failure as the bigger organization is beginning to enter into a period of massive transformation and churches are suffering from all kinds of influences over which they have no control. Visioning therefore is not as useful as selecting a lens through which the organization can make some decisions. Each scenario contained some possible activities and challenges that the church would be facing, and the committee overseeing the work was charged with refining these down to a report that would, to use my own terms, be a collection of heuristics for the way the organization would act as it addressed future challenges. Our process was very informed by some thinking I have been doing with Dave Snowden’s “Simple rules for dealing with complexity.” Notably principles about avoiding premature convergence, distributing cognition and disrupting pattern entrainment. Furthermore, the follow up work will be informed by the heuristic of “disintermediation” meaning that the team working on the project will all be working with the raw data. There is no consultants report here. The meaning making is still very much located with the participants. So here was our process. At small tables of four, participants were given 5 minutes to read over the scenarios silently. We then entered a period of three 15 minute small group conversations on the topic of “what do you think about these scenarios?” Cafe style, each conversation happened with three different groups of people. I was surprised how much introduction was going on as people met new folks. The question was deliberately chosen not to be too deep or powerful because with a simple question, the participants will provide their own depth and power. When you have a powerful need, you don’t need to contrive anything more powerful than what people are already up for. Following the cafe conversations, a round of silent reflection in which people were given the following direction. “Express your preference for each of the scenarios on a scale of 1-7. Seven means “Let’s do it” and one means “No Way.” For each scenario write your preference on your post it and write a short sentence about the one concrete thing that would make your vote one point higher.” So there is lots in this little exercise. First it’s a way of registering all of the objections to the scenarios without personalizing them. Secondly it gets at concrete things that the team can do to improve scenarios and third it harvest preferences and not simple yes/no decisions which are not appropriate for this kind of work. At each table someone gathered all the posts its of the same colour and by colour folks came to the front and placed them on the scale. Doing it this way meant that no one was sure whose preference was going where and it also meant that people couldn’t revise their post its once they saw how the preferences were being expressed. The whole thing took about 75 minutes. The result of this sense making was the chart you see above. Two hundred pieces of finely grained information ordered by the people themselves. The project team now has at least three things they can do with this material. 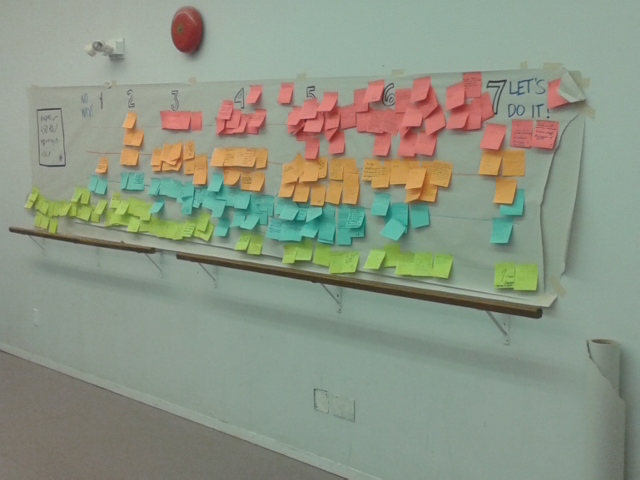 They can recreate the scale, as each post it is colour and preference coded. That way they have a rough idea of the scenario with the greatest support, and they can show anyone who wants to see metrics where we stand on the proposals. They can cluster post its for each scenario according to “work that will make it better” which means they don’t have to pay attention to the scale. The scale is completely subjective, but each of these post-its contains one piece of concrete information to make the scenario better, so in some ways the numbers don’t really matter. They can cluster these ideas by each scenario AND they can re-cluster them by each topic to give an idea of overall issues that are happening within the organization. If we wanted to go a step further, we could use these post it notes to do a number of Cognitive Edge exercises including a Cynefin contextualization (which would tell us which things were Obvious, Complicated and Complex (and maybe Chaotic) and we could also do some archetype extraction which might be very useful indeed for constructing the final report, which would stand as an invitation to thier new personal and an invitation to the congregation. The daughter's pretty good, eh? Thanks Chris! always helpful to learn more about Cynefin, and how to apply it! Could you say more, maybe in another blog post, about “disrupting pattern entrainment” – didn’t encounter that till now; so I really don’t get it! Thanks Ria. I think I will write a blog post on this. But basically pattern entrainment is the way we as humans acquire a familiarity with certain ways of doing things based on past successes. This can help or hinder us in addressing issues. We can look at best practices and apply them once we have learned them for problems that are knowable and not too context dependant. But this pattern making ability can be our worst enemy as we address novel situations. I might actually post something on the way the Canadian army figured out how to take Vimy Ridge in the first world war, as that happened not too far from your house and represented a break nwith the way that European powers had fought wars over the past few hundred years.